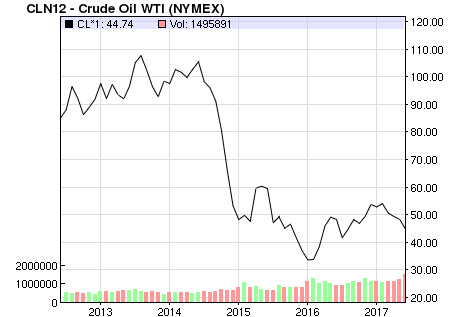 The cycle of oil is older than the hills: Prices rise or fall as supply and demand dip and recover. Drivers see it in prices at the pump. Investors see it in stock and commodity movements. It seems like a process that could continue forever. Well, we’d like to think so, anyway. Of course, we’ll have to face the facts someday: Oil is not a renewable resource. Once it’s gone, it’ll be gone for good. And that ending may be closer than you think. What Even Is Peak Oil? 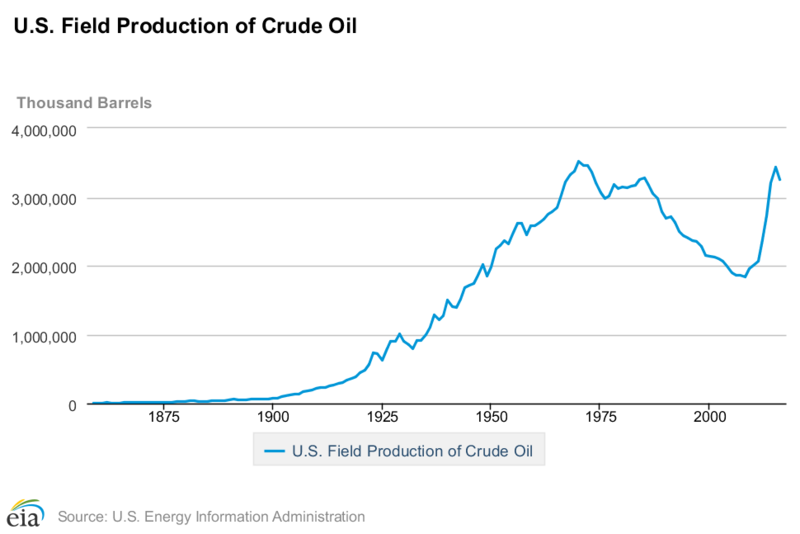 First, let’s get this out of the way: Yes, peak oil is a real thing. Moreover, peak oil is a real threat to a huge segment of the energy industry. We can only hope that new energy sources rise to the challenge of replacing oil in our energy mix before we run out of it entirely. The next question becomes: When will it happen? Some say we’re already there. The first peak oil theory was created by M. King Hubbert, who claimed that the U.S. had hit peak oil when production in 1970, the year when the country’s production rose to 9.6 million barrels per day, then dropped. Of course, this theory was beaten to a pulp in April of 2015 when shale resources brought production up above 9.7 million barrels per day. We’ll hit another major milestone in 2020 when the market for electric vehicles (EVs) really takes off. You see, more than half of the world’s crude oil supplies are refined and used in transportation. Road vehicles alone use about 47% of all the oil produced worldwide. 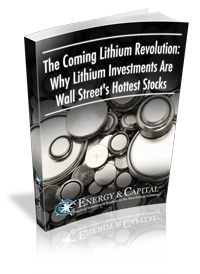 Meanwhile, companies like Elon Musk’s Tesla are accelerating the lithium revolution, which includes the transformation of transportation all over the world. By 2040, EVs could account for as much as 35% of all new car sales, and will represent an increasingly large portion of our vehicle population. As EVs take the stage, oil may be pushed to the sidelines. 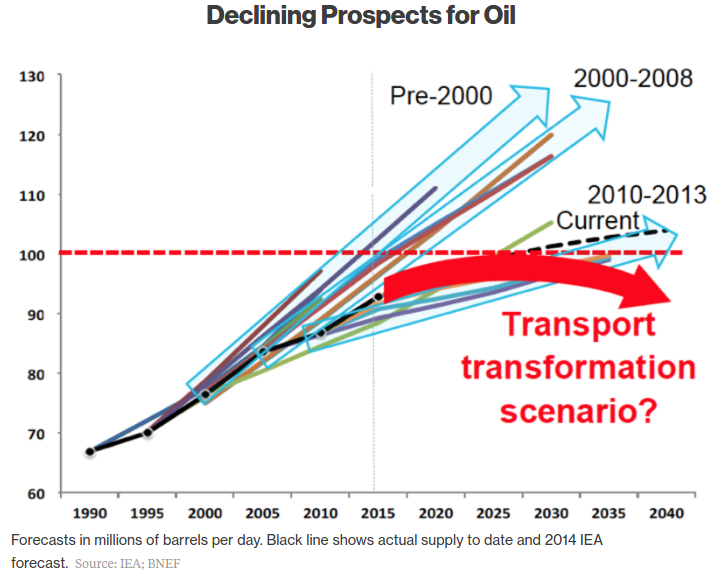 A slightly more optimistic estimate, using data from Bloomberg New Energy Finance and the International Energy Agency (IEA), claims that we have until 2030 before oil demand peaks. As time goes on, the outlook just keeps gets bleaker for this fossil fuel. And don’t think the U.S. pulling out of the landmark Paris Agreement will do anything to halt this trend. The U.S. is just one country, and there are others with even more clout that could change the course of oil’s momentum. The world consumes just short of 98 million barrels of oil per day. That’s 4 million barrels of oil gone every hour, used in cars, planes, trains, in factories, plastics, and numerous other chemical production processes. If you drive a traditional gasoline car, you use oil. If you have a phone, laptop, or computer, you use oil. And if you use, wear, or own anything made through industrial means, you benefit from the use of oil. Global oil demand, as you can imagine, is still on the rise — especially in developing energy markets such as China, India, and Africa. Global consumption is expected to increase by nearly 4 million barrels per day through 2040, according to the IEA. By 2035, China’s oil demand is expected to grow by nearly 63%. According to the BP Energy Outlook, energy consumption in China’s transportation sector will grow 93% in that time, but oil’s share of the market will slip from 91% to 86%. India’s demand is expected to grow even faster than China’s. It will account for more than 45% of the world’s oil demand growth. The IEA estimates that by 2040, the country’s demand will reach nearly 10 million barrels per day. Two-thirds of this growth is expected to come from the transportation sector. Around 40% of the country’s refined oil use comes in the form of diesel, though regular gasoline is becoming more popular. By 2040, India’s use of oil for electricity will have increased but will still only account for about 2.4% of its total energy production. Oil demand in Africa is slated to grow by 78% by 2035, where it holds an unusual position as the region’s main source of energy and covers 40% of Africa’s energy demand. Africa’s energy production will increase by 39% through 2035, but oil’s share of energy production is expected to slip slightly to 39% as natural gas takes the lead. The U.S., currently one of the biggest oil consumers in the world, is expected to see a slight slip in oil demand between now and 2040. By then, the country’s total demand will be around 17.5 million barrels per day, down from 18 million barrels per day in 2015. A decrease in demand from the transportation section will be offset by increased industrial demand over the next 30 years or so. You may have noticed that much of that new demand will come from transportation. That’s because a majority of today’s global crude oil supplies are used in the transportation sector. This includes passenger cars, trucks, buses, planes, and trains of all kinds. Of the crude oil used for transportation, 55% is turned into gasoline for cars, and another 21% is turned into diesel fuel. This makes transportation one of the oil industry’s biggest customers and also puts the industry under the most pressure. You see, as energy efficiency standards get stricter and EV use becomes more common, a portion of oil’s energy market share will be wiped out. This change on its own is the source of much debate. How big will EVs get? 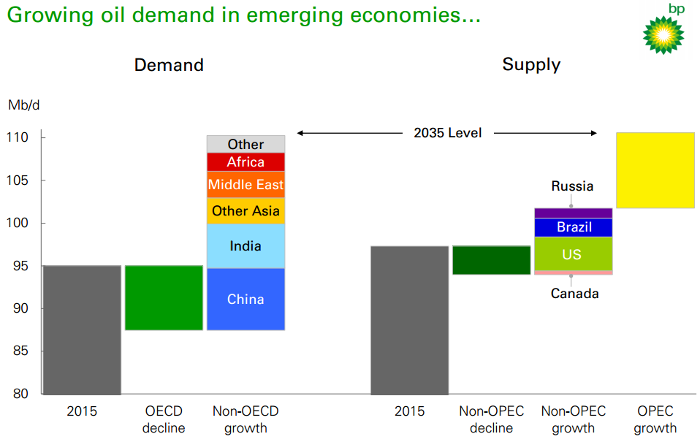 How much oil demand will they really offset? And when? Remember, we’d like to see oil demand peak before supply does but not so soon that the industry can’t bounce back. For right now, we’ve got more than enough oil on the market to cover demand. In fact, the market is currently in a glut. Around 2008, the U.S. began to develop its shale oil resources in earnest. And in recent years, the country’s production has grown and even eclipsed some of the world’s top oil producers. It was the competition between the U.S. and these top producers that brought oil prices down from more than $100 per barrel in 2013 to a low of less than $30 in 2016. OPEC (Organization of Petroleum Exporting Countries) is made up of 14 countries: Saudi Arabia (unofficial head of the organization), Iran, Iraq, Venezuela, Algeria, Indonesia, Nigeria, The United Arab Emirates (UAE), Kuwait, Qatar, Libya, Ecuador, Gabon, and Angola. Of these, the highest producers are Saudi Arabia, Iraq, Iran, and the UAE. OPEC members account for half of the top 10 oil-producing countries in the world, and the organization as a whole accounts for about 40% of the world’s total crude oil production. As of 2016, Russia was the world’s largest oil producer, followed by Saudi Arabia. Both countries produced more than 10 million barrels per day average that year. However, both have also cut production as part of a deal meant to balance out the glutted oil market. Thus far, it’s only been somewhat beneficial to oil prices, though it has allowed U.S. shale to expand more quickly than ever before. In 2016, the U.S. came in third for average oil production. It’s worth noting that for a time, the U.S. produced more oil than both Russia and Saudi Arabia. It was this competition that pushed prices too low and forced the larger producers to cut back. U.S. production has been on the rise since oil prices reached $50 per barrel. As you can see, there does seem to be some merit to the peak oil production claim made all those years ago. While monthly numbers have gone above and beyond the 9.7 million barrel per day estimate, the yearly average seems to hit a ceiling around 3.4 billion barrels. Will we ever break through that ceiling? Will there even be demand for the oil if we do? Demand for oil is still alive and while some countries are struggling more than others, there are plenty of investment opportunities to take advantage of. At Energy & Capital we are always searching for lucrative ways to invest in various sources of energy, especially oil. Our team of experts currently has numerous oil investment opportunities that you should take a look at and see if they are the right type of investment for you. You can view their various research reports in either the Premium Publications page or under their profile in the Editor's Section. This is a critial time for energy investors and those who are positioned properly stand a chance to see some significant gains added to their portfolio. Keith Kohl has what investors need to know to properly take advantage of Peak Oil. Keith Kohl reveals the Peak Oil report that has been buried by the Australian government for over two years. Why the world relies too much on the output of giant oil fields... and where investors will turn when these massive fields fail us.